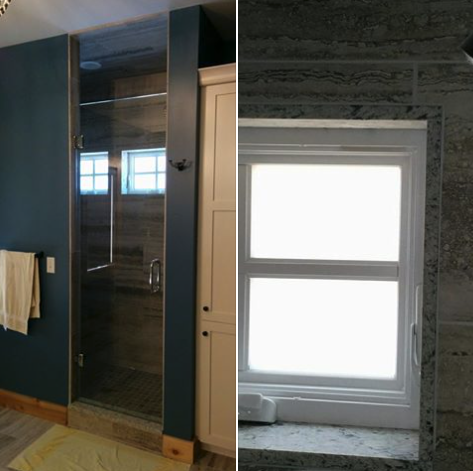 Roscommon County, Michigan – This homeowner can shower in comfort now that their windows have frosted film thanks to LLumar Window Film white frost installed by the team at All Season. Decorative window films for privacy are a perfect fit for shower and bathroom windows because window treatments are not ideal for high moisture areas. the frosted film we used at this Higgins Lake home in Roscommon still allows the natural light to enter the area, but provides a comfortable level of privacy. No more peeping neighbors and the frosted window film looks great! If you are interested in learning more about how decorative privacy window film can add privacy and enhance the style of your home, click HERE or give us a call today. You can contact the team at All Season Window Tinting by calling 989.375.3868 for an absolutely free, no obligation consultation and quotation on implementing home window film. Our service areas include Traverse City, Grand Rapids, Cadillac, Petoskey, Roscommom, Ludington Michigan and their surrounding areas.